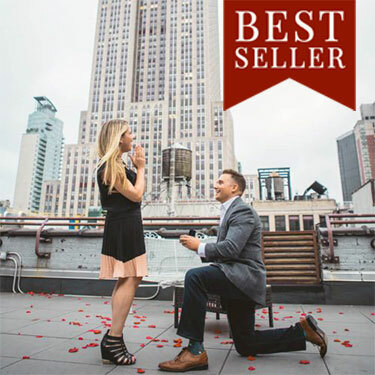 Proposal 007 is a New York-based marriage proposal planning team. 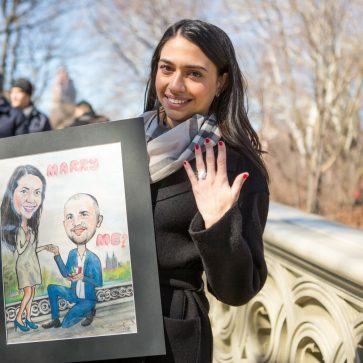 Established by The New York Times-featured secret proposal photographer Vlad Leto, and event planner Tatiana Caicedo. 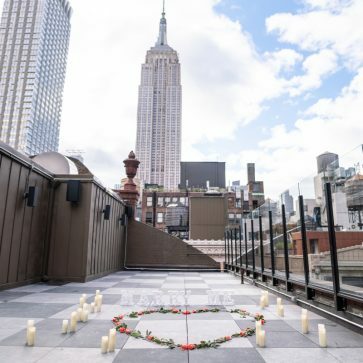 This spring surprise your partner with a romantic proposal in a park or private rooftop with a breathtaking view. 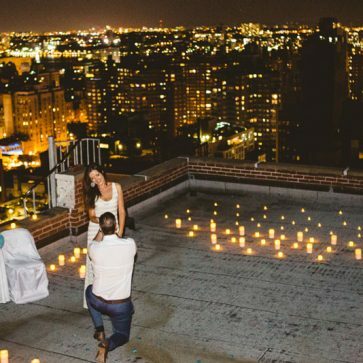 Propose on a private Manhattan or Brooklyn rooftop with breathtaking views of the city, or visit the landmark skyscrapers of New York, famous around the world. 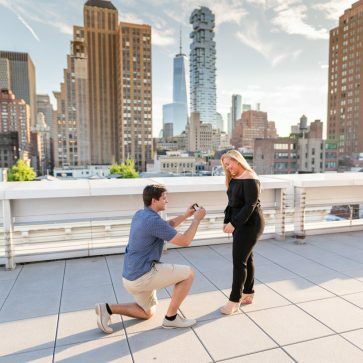 Enjoy the amazing views, and propose when the moment is just right. We will take care of the rest. 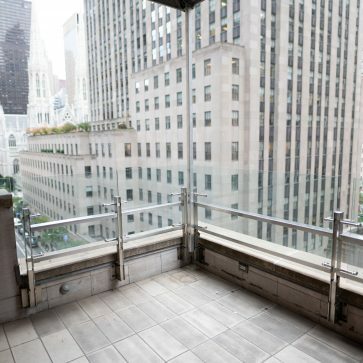 Classic Empire State Building view rooftop. 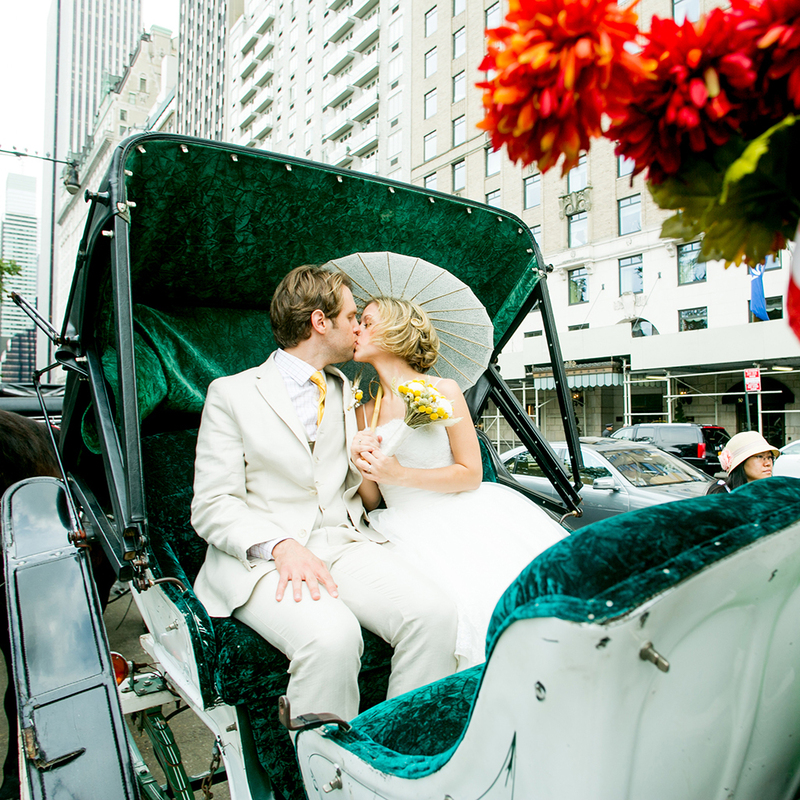 Walk hand-in-hand through the world famous Central Park and soak up the romantic atmosphere. 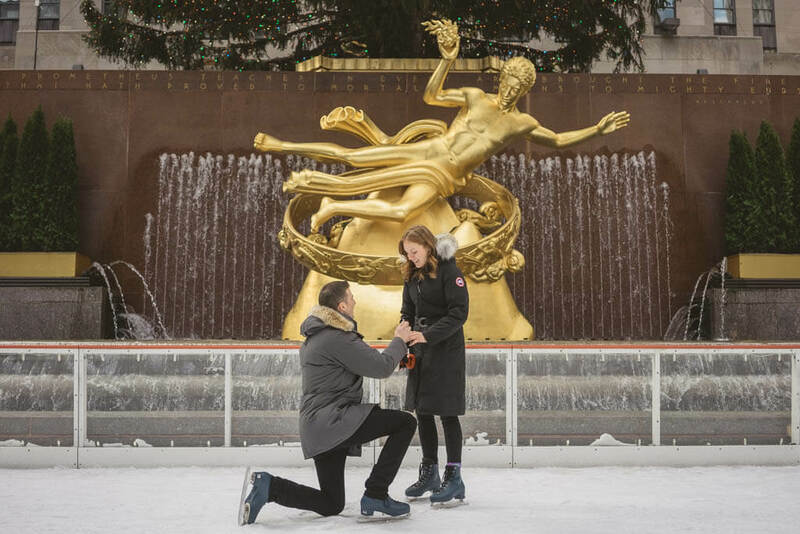 We offer many special ways to propose to your loved one in this historic park. 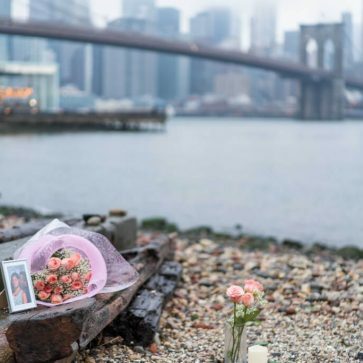 Walk across the Brooklyn Bridge and enjoy the city views and the gorgeous Brooklyn Bridge Park nearby. 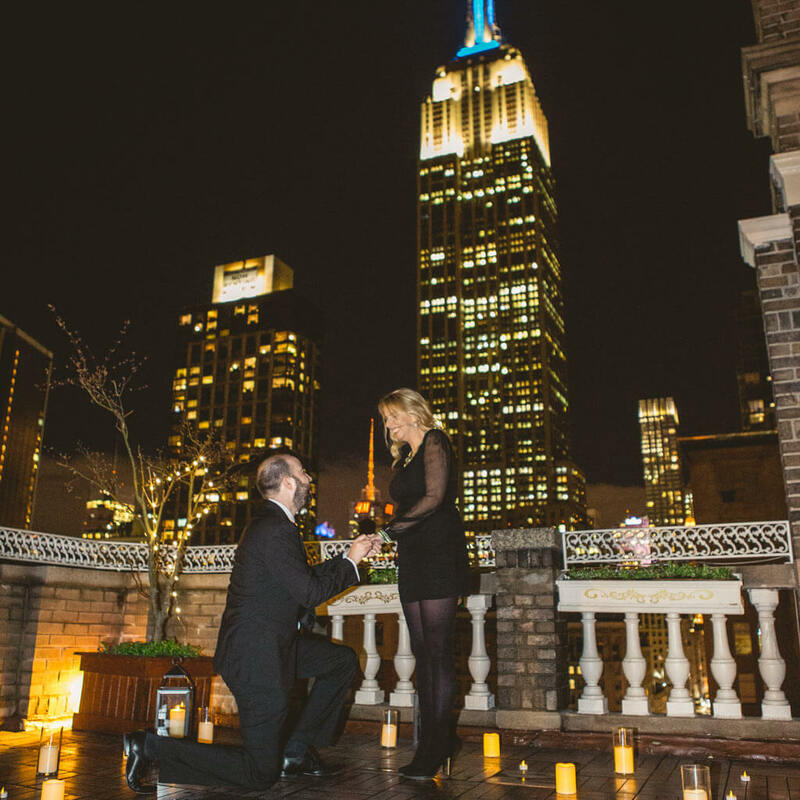 Propose to your significant other with the best views of the city as your backdrop. 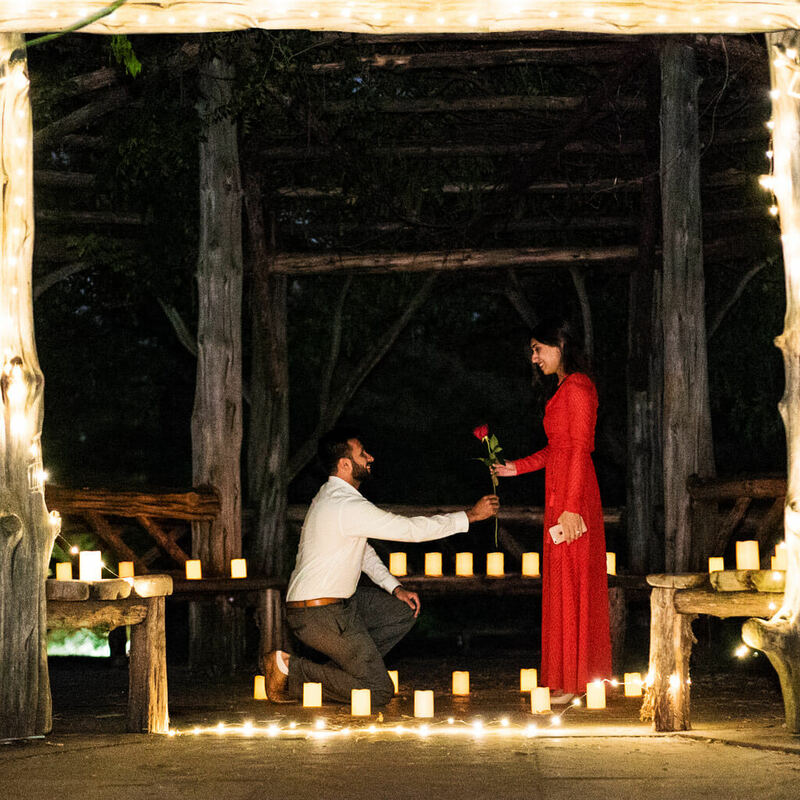 We will make it romantic; you will make it unforgettable. 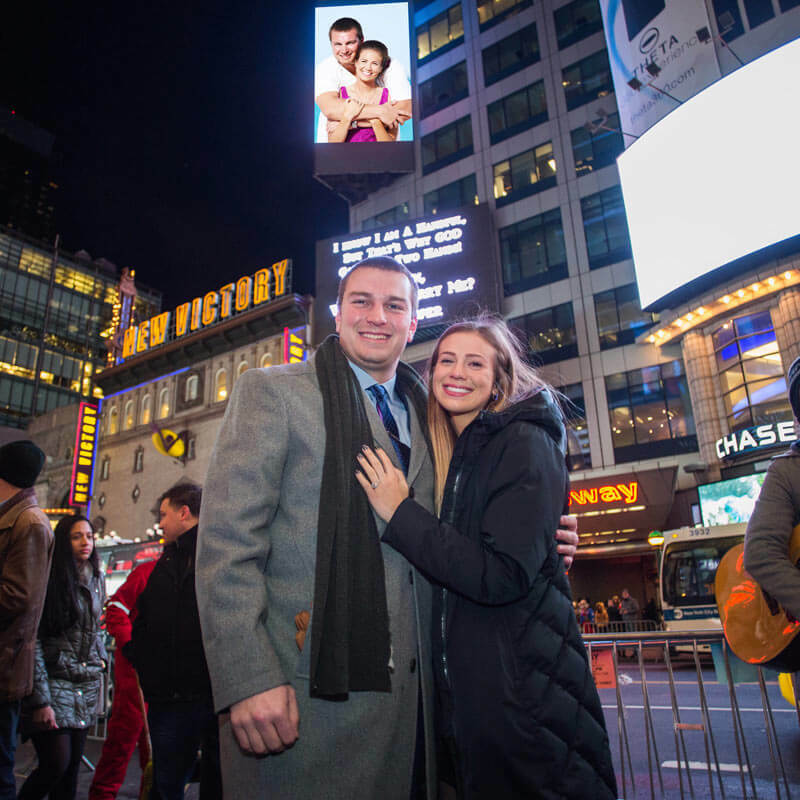 Times Square Billboard proposal is always big and shocking. 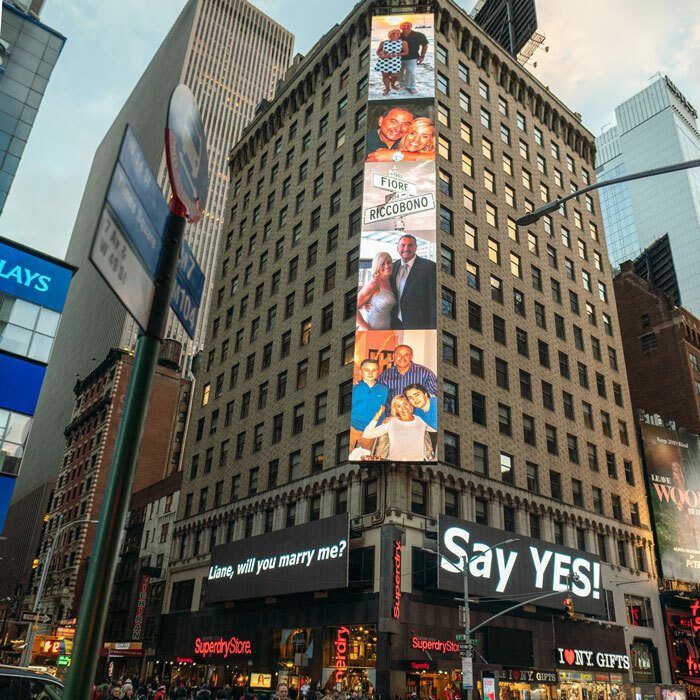 Choose between 2, 5 and 11 screen billboards. 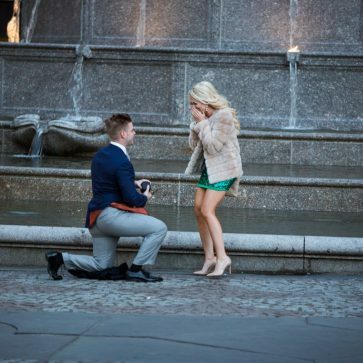 Make the engagement unforgettable. 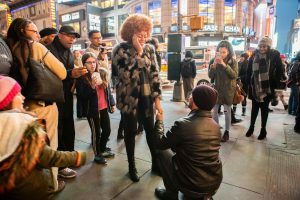 There are so many unique ways to propose in New York. 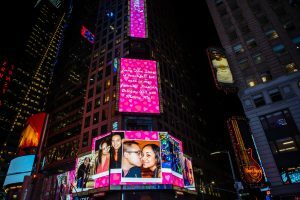 You can take a wine tour or a helicopter ride, propose on a boat or use the Times Square billboard. 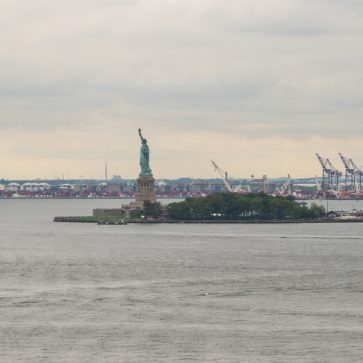 New York is full of amazing places with breathtaking views. 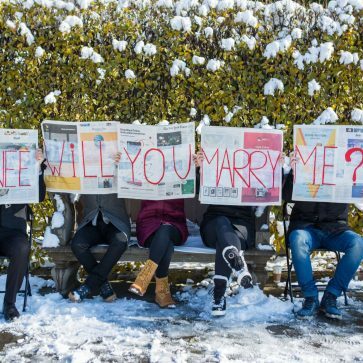 Be creative, be unique, and use your proposal to explore the city with your partner. Together with our star photographer, Vlad Leto, we will create your photo story. 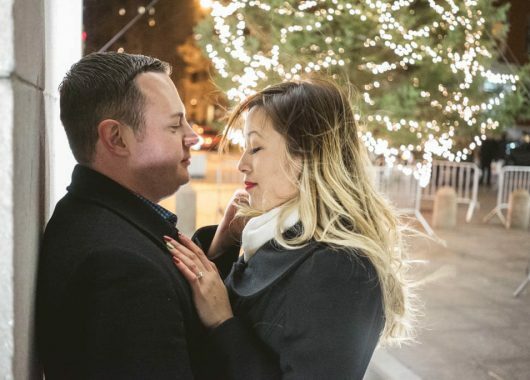 Before the proposal, we will send you a map detailing the route from your location or hotel to the proposal spot. 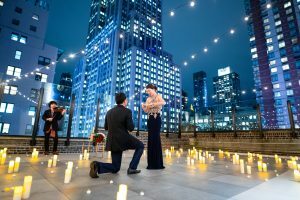 On the day of your proposal, our photographer will take pictures before, during and after the event. 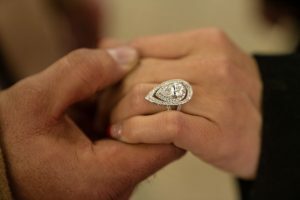 We use special, paparazzi-style equipment so that your significant other will never find out before the time is right! 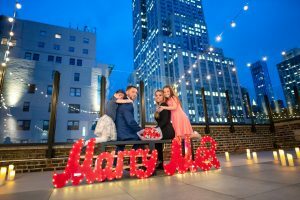 While planning your marriage proposal, we will also take the time to discuss and plan your proposal video. 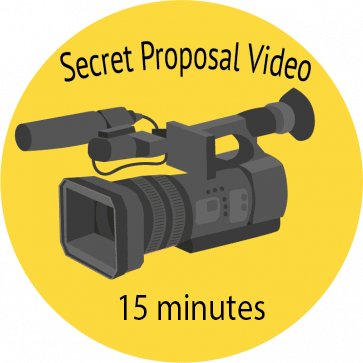 First, we will record an interview with you, which we will then edit into our final proposal film. 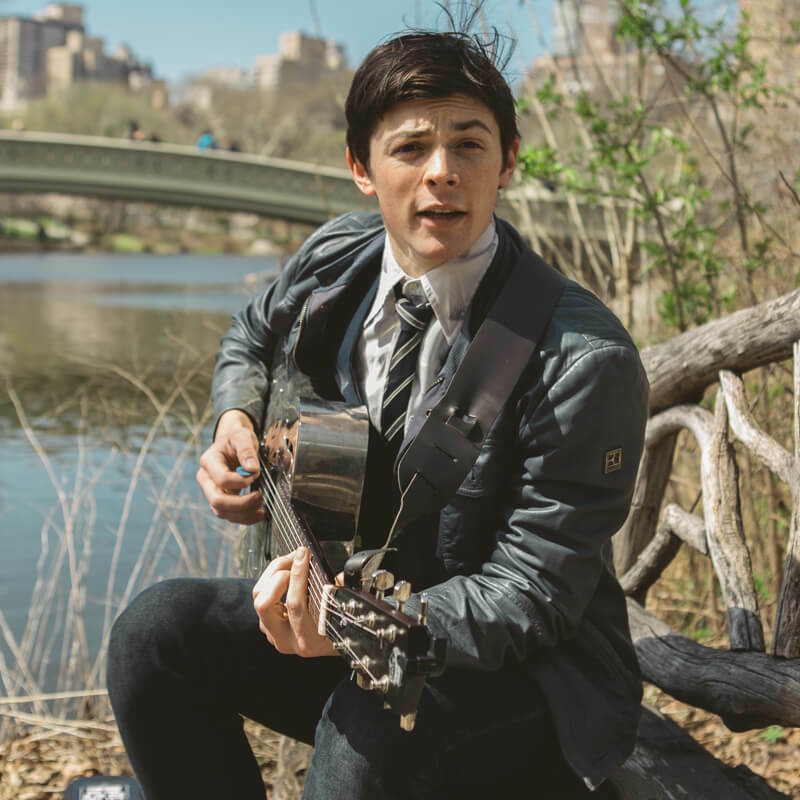 If you are located in NYC, we can arrange an appointment in our studio. If not, we can arrange a recorded Skype interview. 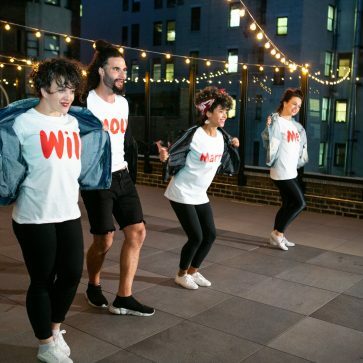 Once you’ve told us about your plans, we’ll start scripting and planning positions and roles for our team on the big day, as well as where you and your friends/family (if you want them in on the secret!) will be. 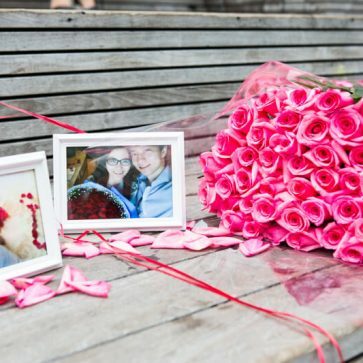 On the day itself, we will capture the whole occasion on video. 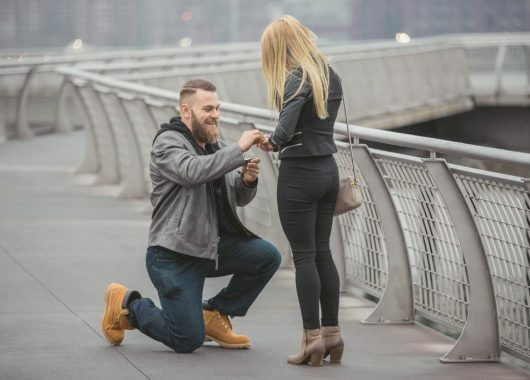 After the proposal, we will record a chat with you and your significant other about your experience of the day. 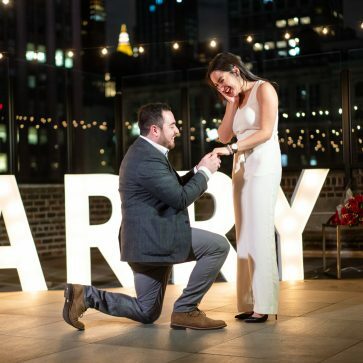 We will then edit all of this together using professional equipment, splice in your chosen song, and present you with your full proposal story. 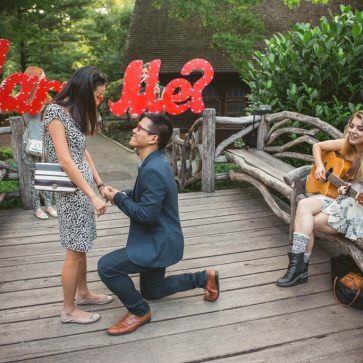 Finding a creative marriage proposal idea is tough; it is important to be original but you don’t want to overdo it. You dont want to make it too simple as well. 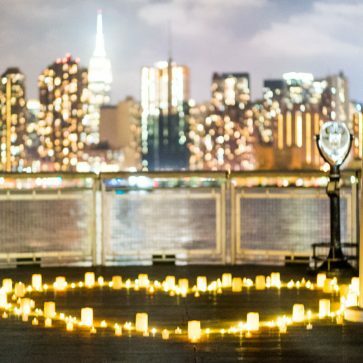 Make it personal and special for her: if you’re NY -ers, take her to the place where you had your first date, or where you first kissed. 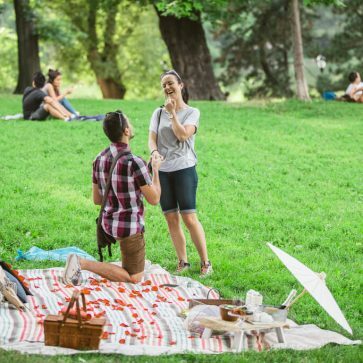 Use your friends and family to help you organize the perfect, fun day for your future life partner. Don’t want to be that obvious? Not sure if your relatives can keep it a secret? Running out of ideas? That’s where we come in. 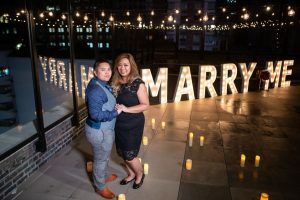 We will build 3 unique marriage proposal ideas for you based on your relationship. 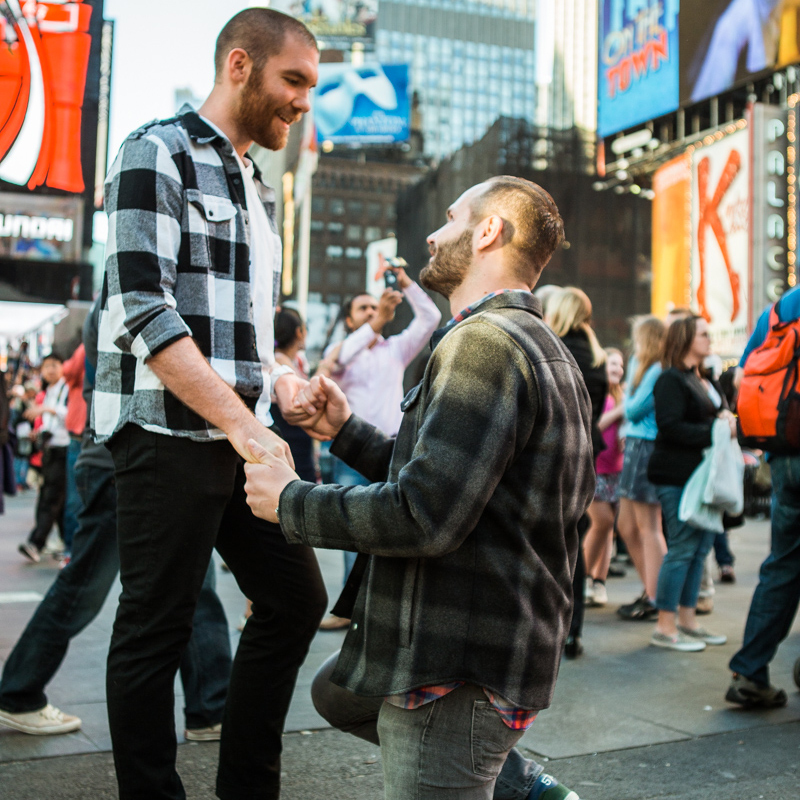 We will help you to organize the perfect proposal that suits both you and your significant other. 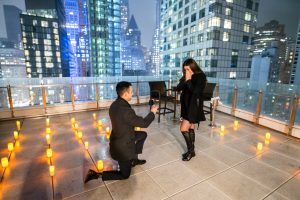 We will recommend you the best places for your proposal, so that you can choose the one you like. 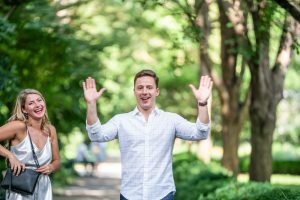 We are here to relieve the stress of what can often be a mentally exhausting process. 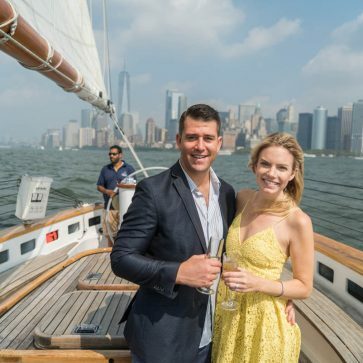 We want you to have awesome time and enjoy the moment. 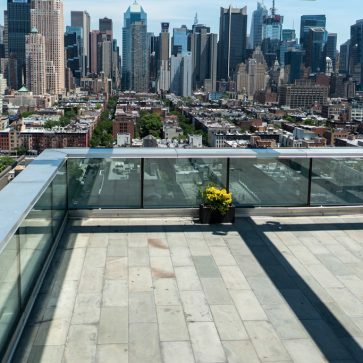 Not to mention, we are based in New York. 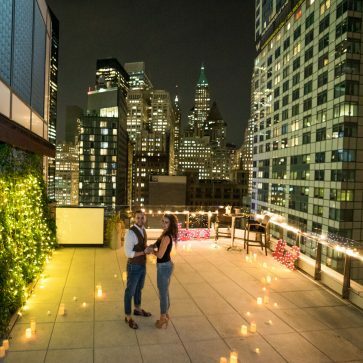 With our knowledge of the city we can recommend some of the most intimate and charming locations that NYC has to offer. 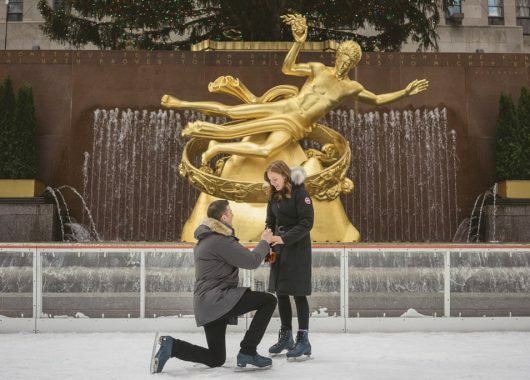 New York, New York: the city is a magnet to helpless romantics all over the world. 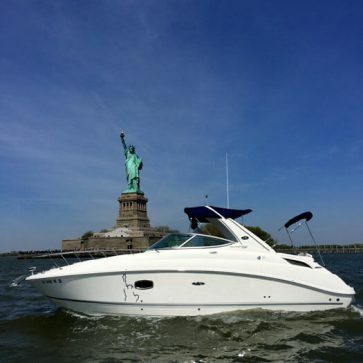 The narrow streets and impressive skyscrapers are sure to make anyone fall in love with the Big Apple. 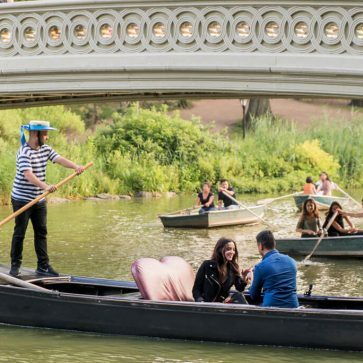 And what could be more romantic than proposing to your significant other in this wonderful place? 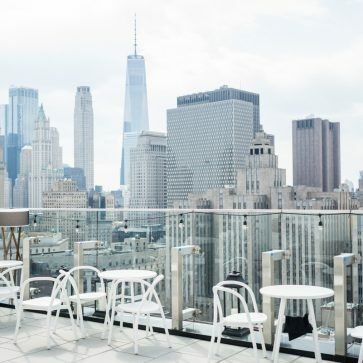 There is something for everyone here, whether you are aiming for a big bang or looking for something quieter, you can find it all in New York. 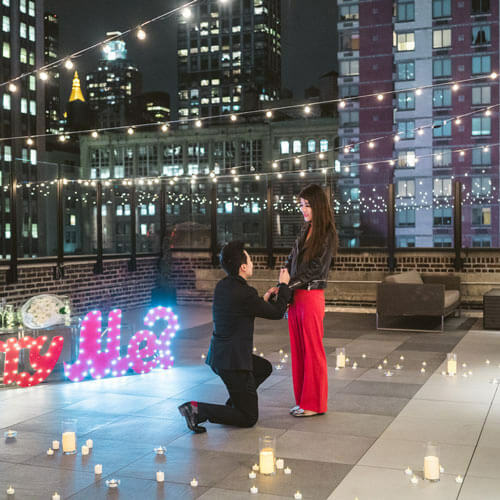 Our proposal ideas in New York vary from romantic picnics in Central Park to a surprise yacht trips around Manhattan, awesome Times Square billboard proposals to romantic rooftop dinners, onstage Broadway Musical proposals to proposals during mouth-watering city chocolate tours. 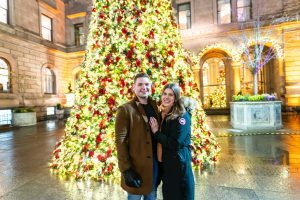 Keep in mind that we really know this city; we know the cute places that the tourists don’t, and all the hidden parks and places that only the inhabitants of NYC know about. 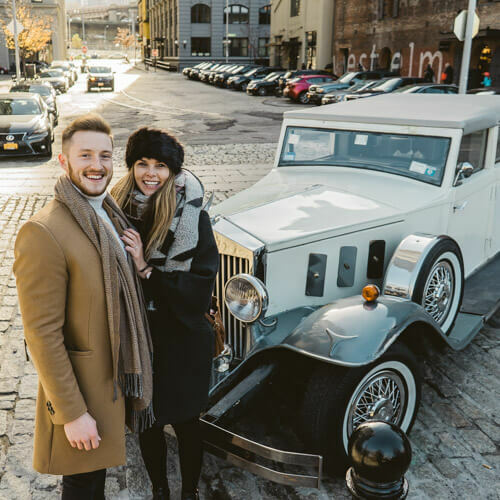 If you used to live in New York and planning a homecoming to this wonderful city, our team is specializing on the small weddings as well, so we will help you organize small, intimate wedding of your dreams. 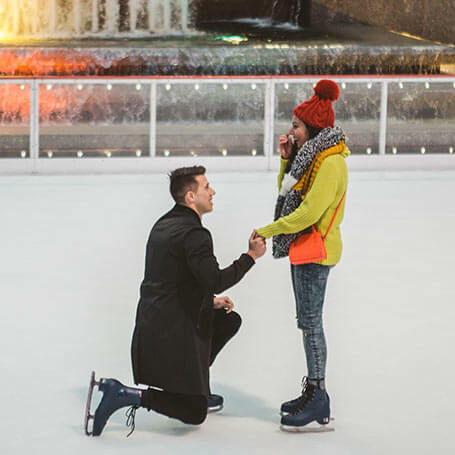 You’ll be telling this story to your kids and grandkids, so you’d better make sure your proposal story is a good one! 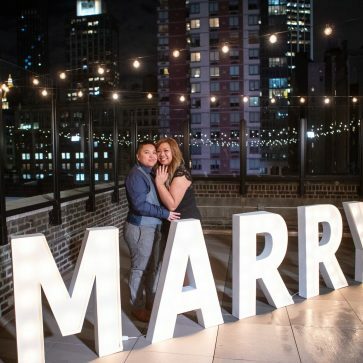 There are so many good engagement ideas out there, so you’ll need to be unique and keep it romantic. 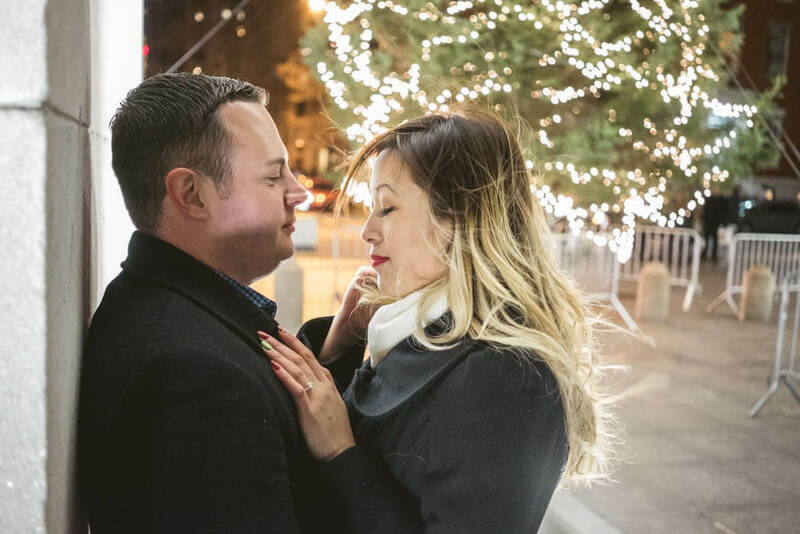 We’ll assist you throughout your planning; our experience in this field gives us an edge on what you can expect from a proposal. 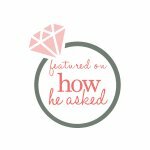 Of course, every person is different; we can’t guarantee that your partner will say yes… but we will certainly create the most beautiful atmosphere for a positive answer! So how does it work? A detailed quiz will be sent to you and, based on your answers, we will create 3 appropriate engagement ideas. 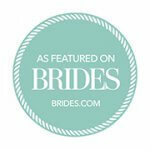 We work directly with you, taking every little detail of your relationship into consideration. 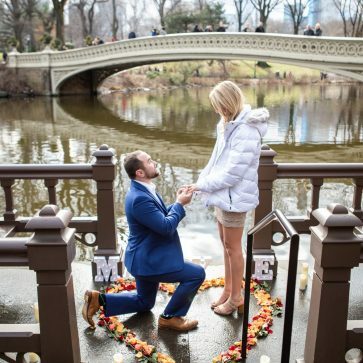 We will work together to make that day perfect for her ( or for him). 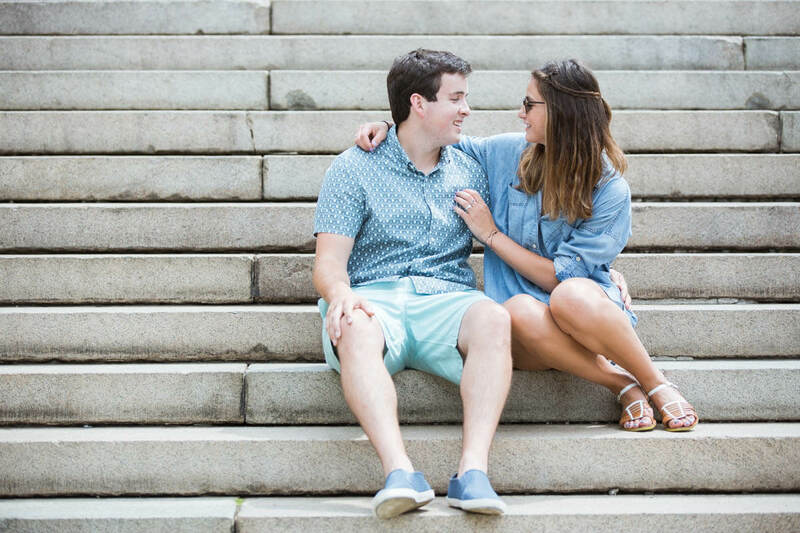 Our 3 engagement proposal ideas will all come equipped with a list of suitable venues and a detailed map. 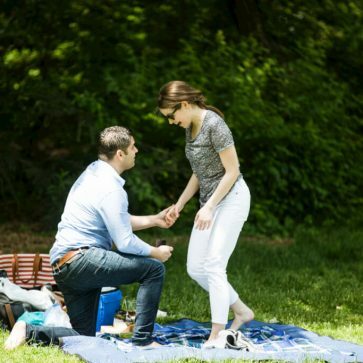 That leaves the most important part to you: popping the question! 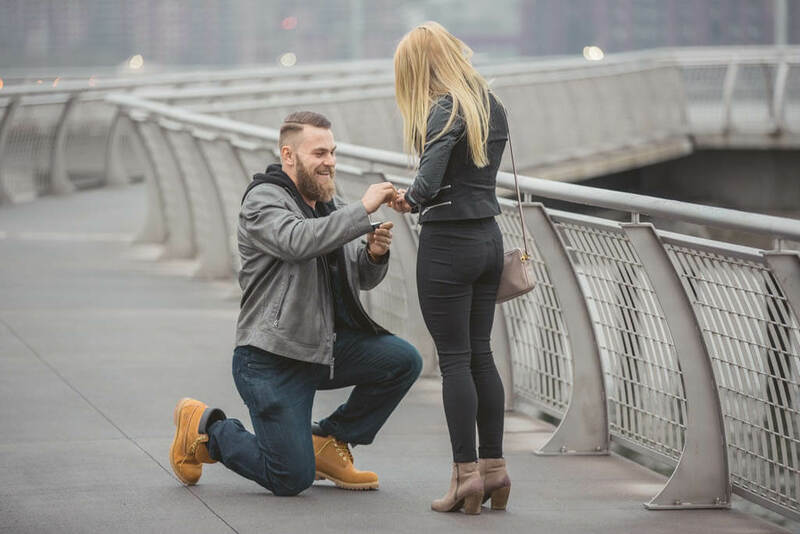 Our team will be there to support you during the entire process, making sure that your table is reserved, your flowers are picked up, and the ring is safe in your pocket.